Depending upon which local blog you read, L.A. City Attorney Carmen Trutanich is either a thug, bully, clown, pathological liar, or simply unfit for office. One example of his perfidy, most recently cited in a political attack ad by a candidate for District Attorney, is last year’s arrest and the setting of $1 million bail for a Hollywood building owner charged with violating the city’s ban on supergraphic signs. The internet ad for Alan Jackson, a deputy district attorney running to replace current D.A. Steve Cooey, lists “Million Dollar Bail for Misdemeanor” as one of a number of reasons Trutanich has been a “huge disappintment” and should not be elected District Attorney. Trutanich, who was elected City Attorney in 2009, has not officially entered the race, but recently formed an exploratory committee and conducted fundraising, according to media reports. The “Million Dollar Bail” affair attracted widespread media coverage, but for memories that may need refreshing, here’s a capsule account. Kayvan Seterah, the owner of a historic office building on Hollywood Blvd., was arrested after allowing an unpermitted 10,000 sq. ft. vinyl ad for the movie, “How to Train Your Dragon” to be wrapped around the building. Seterah, a Pacific Palisades resident, was held on $1 million bail over a weekend, but released on reduced bail after the sign was removed. Shortly before the 2010 Academy Awards ceremony in March at the Kodak Theater on Hollywood Blvd., a website for a company called iMedia Outdoor began marketing signage space on Seterah’s building at 6777 Hollywood Blvd., directly across the intersection from the Hollywood & Highland complex that houses the Kodak Theater. A brochure posted on the website touted the fact the ads would be visible to the millions watching the traditional outdoor “red carpet” arrival of movie stars. According to court documents, the city attorney’s office sent a cease and desist letter to Seterah’s attorney and to a representative of iMedia Outdoor after learning of the plans to put up the signs. In a sworn declaration, Deputy City Attorney David Shepherd said Seterah’s attorney told him that Seterah had been informed of the letter. Shepherd also declared that an attorney representing iMedia told him that the company had decided not to proceed with its plans to erect the signs. Shepherd further said in his declaration that he had twice prosecuted Seterah for criminal violations of city building codes stemming from construction work on the building, originally built in 1927 as the First National Bank Building and at the time the tallest building in Hollywood. Building department records show that Seterah has also been cited for prior sign code violations at that building and at another building he owns in Hollywood. 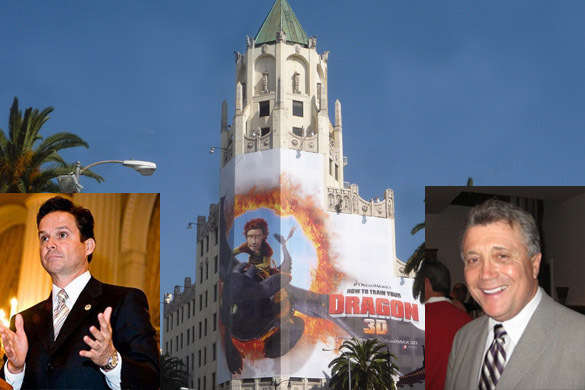 Two days after being told by the iMedia Outdoor attorney that the signs would not be installed, the city attorney’s office learned that a supergraphic sign advertising the Dreamworks animated film had been hung with bolts and cables from three sides of the building, Shepherd said. According to officials at the city’s Department of Building and Safety, nobody had applied for a permit for the sign, and no inspection had been made. The City Attorney’s office then filed criminal complaints against Seterah in Los Angeles County Superior Court. In a hearing before Judge Mildred Escobedo, officials testifed that the sign, estimated to weigh at least 1,000 pounds, presented a serious danger to motorists and pedestrians at the busy intersection if the sign’s attachment failed, as had happened just a few blocks down Highland Ave. when a large, illegal supergraphic detached in a gust of wind and fell into the street. In asking for $1 million in bail, the City Attorney also cited concerns repeatedly voiced by fire officials about supergraphic signs covering building windows, hampering firefighting efforts and endangering the lives of both building occupants and firefighters. Even though the code violations were misdemeanors and the bail request undeniably high, the judge obviously agreed with the seriousness of the allegations. Seterah was then arrested on a Friday night and remained in jail until the following Monday, when the City Attorney’s office told the judge the sign had been removed. Bail was then reduced, and Seterah released. For those appalled by the spread of the multi-story supergraphic signs and the fact that so many sign companies and property owners were apparently eager to place profit above the welfare of building tenants and the public at large, the city attorney’s action was a matter for applause. And the reverberations were almost immediate: When other cease and desist letters went out to property owners who had allowed their buildings to be turned into giant ads for movies, cars, fast food, and other products and services, those signs started disappearing. Combined with aggressive enforcement and successes in court, very few of the hundreds of illegal supergraphic signs once blighting the city’s landscape can still be seen. What would have happened if the City Attorney had asked for bail that his most vocal critics would have considered reasonable for a misdemeanor? $25,000, say, or even $50,000? It’s easy to guess that Mr. Seterah would have posted that bail, that the sign would have stayed up through the Academy Awards, that he would have pocketed a tidy sum, that Dreamworks would have been pleased with the exposure for their film. Only those who had long despaired over the city’s failure to crack down on blatant violations of the sign laws would have come away unhappy. As for what could have happened if a sharp wind had gusted on the night of the Academy Awards with crowds in the street below, or if a fire had broken out on an upper floor of the building, behind those windows blocked by the sign? Perhaps that question should be posed to Alan Jackson’s campaign manager, or to the blog authors and commenters who have hurled epithets at the City Attorney. The foregoing is not intended as a blanket defense of the City Attorney’s activities in all areas, nor is it an endorsement of his possible candidacy for District Attorney. But in the volatile arena of billboards and signage, his actions have restored lost faith in the ability of the city to enforce its laws and protect communities from the predations of unscrupulous sign companies and property owners. For that, many people are grateful.